Understanding Society: How do the poles of current PSS interact? 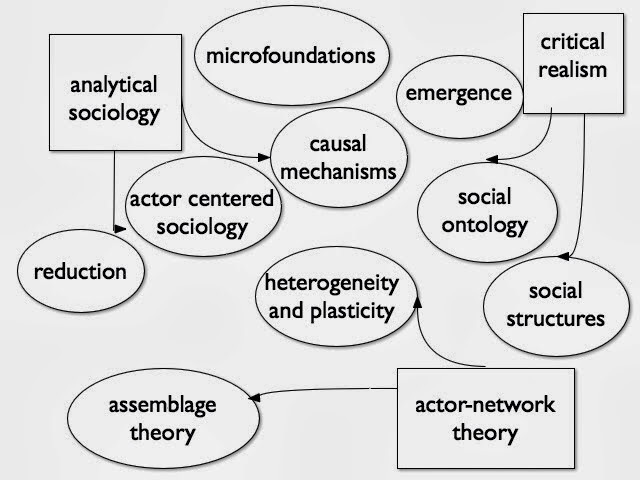 An earlier post offered a diagram of current topics in the philosophy of social science. 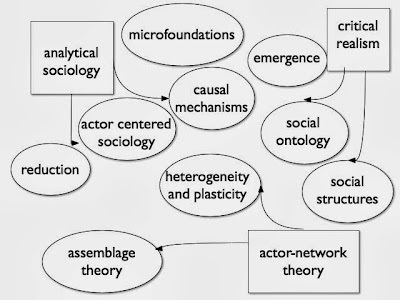 The three poles of this diagram were analytical sociology, critical realism, and actor-network theory. Here I would like to look more closely at how these polar perspectives interact with each other. To start, it is clear that these three beacons serve as poles of the field. There are vehement differences in method, philosophical style, and substantive findings across the three frameworks. 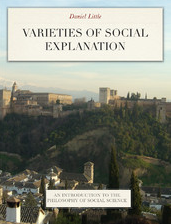 Analytical sociology favors a broadly speaking reductive approach to social explanation, relying heavily on the diagram of Coleman's boat to illustrate how social explanation should proceed. It favors an enlightened version of methodological individualism, where social reality is constituted by purposive actors in constrained circumstances. It favors causal explanations couched in terms of causal mechanisms. And it presents a philosophical style that gives priority to clarity and simplicity over extended and sometimes obscure philosophical theorizing. Critical realism disagrees with almost all of these premises. It staunchly defends a non-reductionist understanding of social structures, with structures being seen as possessing stable causal powers. It rejects the idea of reducing social properties to the combined effects of individual actions, often favoring emergence over reduction. It does not accept the logic of Coleman's boat, because it recognizes the reality of type 4 causal relations from structure to structure. And it is founded on a philosophical system that many readers find needlessly obscure -- Bhaskar's transcendental ontology. Actor-network theory appears to be at odds with both these perspectives. ANT rejects the idea of privileging individual humans as the bearers of social processes. It conveys a luxuriant and often obscure set of philosophical ideas. ANT is ambivalent about the idea of social explanation and causation, in that Latour sometimes privileges description over explanation. And, perhaps surprisingly, it is also skeptical about the reality of social structures, favoring heterogeneous assemblages over enduring structures. So with all these differences, is there room for useful synthesis of these perspectives into innovative ideas about social ontology and explanation? Start with a few resonances between ANT and CR. Both are grounded in a philosophical system (Deleuze, Kant), and they both make use of philosophical arguments to arrive at substantive conclusions. Both take up ontological ideas as being key to an adequate philosophy of social science, and they both offer stringent critiques of received positivist ideas about the nature of the social world. The idea of assemblage may also be a point of partial contact, in that enduring structures might be thought of along the lines of relatively stable assemblages. But a point of contrast is pervasive: CR is realist, and ANT is constructionist. Are there points of contact between AS and ANT? It would appear that there are not. The anti-philosophical bent of AS makes it difficult for AS scholars to read and benefit from the writings of ANT scholars (witness, for example, Hedstrom's dismissal of Bourdieu). The model of explanation that is presupposed by AS -- demonstration of how higher-level entities are given their properties by the intentional actions of individuals -- is explicitly rejected by ANT. And the idea of assemblage -- contingent conjunction of heterogeneous configurations of "actors" in the peculiarly non-individualist sense that ANT adopts -- seems to be a difficult one for AS to take seriously. Finally, what about the relation between AS and CR? On the issue of causation there is a degree of separation -- AS favors causal mechanisms, preferably grounded in the level of individuals, whereas CR favors causal powers at all levels. The CR idea of emergent social properties is a difficult one to assimilate to the AS framework, since AS wants to understand higher-level structures as the compound effect of the constituents. But here there is perhaps room for a degree of accommodation, if CR scholars can be persuaded of the idea of relative explanatory autonomy advocated elsewhere here. Relative explanatory autonomy is a way of reconciling the ultimately individualist ontology of AS with the emergentism of CR. And in fact Robert Sampson's view of neighborhood causation seems a step in that direction. So the three frameworks have little overlap in method or substance. However, the philosophy of the social that is advocated here may be one way of finding commonality among the three poles. The weak microfoundationalism I defend captures at least a part of the AS position without demanding reduction. The scientific realism about social structures that I advocate creates a degree of affinity with CR (or perhaps the CR naturalized described by Kaidesoja), and in any case affirms the central view of CR: that it is legitimate to attribute causal powers to concrete social structures. The views I have developed here about the heterogeneity and plasticity of social entities (and the implausibility of the idea of social kinds) creates a significant link to the assemblage theory that comes out of the ANT tradition. And the framework of methodological localism provides a degree of consonance with the anti-metaphysics of ANT. So I think the philosophy of social science developed here occupies the center of the diagram above, with linkages to each of the polar beacons.